These are the credits where a limit is set in client’s account with an expiry period usually not exceeding one year. This type of facility is applied in client’s current account. In this type of facility client is at liberty to deposit and withdraw money within the validity of limit subject to drawing power of the account, where applicable. When an advance is made in consideration of tangible assets such as stocks in trade, financial obligations etc. usually a cushion is retained as margin in respect of the assets valued at lower of cost or market. Usually margin is fixed as percentage of asset value. The drawing power represents extent of client’s drawing rights to be applied subject to limit set in the account. To arrive at the drawing power the margin is deducted from the value of assets under consideration. If it is found at a subsequent calculation that client’s DP fell short of the amount already withdrawn, necessary arrangements shall immediately be made either to bring down the outstanding within DP or to raise the DP by furnishing additional acceptable assets as security. The overdraft accounts are sub–divided into following categories in respect of security held as well as purpose of the facility. i)Overdrafts-financial obligations: These are the overdraft facilities secured by financial obligations such as FDR, Wage Earner’s Development Bond, Deposits held in client’s account, etc. In this type of facility often a margin is set depending upon banker-customer relationship, subject to terms of lending authority of the approving authority, if any, of which 10% to 20% margin on the present value of financial obligation is regarded ideal. Spread of interest rate over 3.00% is desirable. No instrument standing in the name of minor is acceptable. and advances against the instruments held in other than borrower’s name is generally discouraged. Advances against instruments issued by banks other than DBL is acceptable but extra care including marking of lien from the Instrument Issuing Bank should be taken if such advance is considered. a) the policy is an endowment policy. b) the borrower has an insurable interest in the life of the insured if the policy does not stand in his own name. c) the surrender value is to be ascertained from the issuing company (it shall be borne in mind that policies for less than three years have no surrender value). On the basis of surrender value advance is granted and ideally 20% margin is retained. e) it shall be ensured that the policy is in force, usually by obtaining and examining last premium paid receipt. Overdraft facility extended against credit balance of Deposit Pension Scheme (DPS) is term as SOD-DPS. This category is a variation of overdrafts against financial obligations. These are the overdrafts secured by shares and debentures of publicly traded companies listed with both or either of DSE & CSE. No advance shall be made against shares and debentures issued by DBL. The security is valued at lower of cost or 6 (six) months average of market. These are the overdrafts not covered as mentioned above. These facilities are usually extended to meet client’s various financial requirements of continuous nature including execution of different work orders and granted against personal guarantee, charge on assets of the company etc. which may or may not be accompanied by the collateral security. These facilities may also be secured by stock in trade, inventory or plant and machineries but usually no margin is fixed on those and as such drawing power always equals the limit of the facility. a) The work order must be issued by Government Authority, Semi-Government, Autonomous bodies, reputed Multinational companies as well as reputed local private organizations. g) Obtaining of collateral security is of particular importance in this type of advance. h) In case of work order for construction work finance may be made up to 30% to 35% of work order value. In case of issuance of APG the figure will be subsequently lowered. i) Progress of work is monitored and bills receivables are ascertained from time to time. In this category primary security consists of stocks in trade, inventories etc., possession of which remains with the borrower rather a charge upon those is created in bank’s favor. The stock is valued at lower of cost or market and on the valuation of the stock a margin is set on the basis of which DP is determined. However such stock should not preferably consist of perishable items and the same is subject to bank’s inspection as and when required. In this category primary security also consists of stocks / inventories and is held by the bank instead of the borrower as in the case of cash credit – hypothecation. In case of borrower’s non–repayment bank retains the right to adjust the account through selling of the pledged goods after giving proper notice to the borrower to that effect. These are the loans with fixed repayment terms repayable within one year. The essential difference of this type of loan from Overdrafts or Cash Credit facilities is that this type of facility does not permit the mutuality of operation in the account i.e. the amount once deposited /adjusted is not available for further withdrawal & reduce permanently borrower’s liability to that extent. These are the term loans awarded to the industrial concerns. This facility is usually provided to set up a new industrial project or to modernize and restructure an existing one. Since the time frame of this type of lending do not correspond to the duration of bank’s prime source of funding, generally bank predetermines the optimum extent of global exposure in this sector. As such, consideration of bank’s existing policies and positions in this sector are of great importance in considering a credit request in this sector. ii )Term Loan – Others: These are the term loans made to other than industrial concerns. In this case also, a through analysis of the requested facility is required. Term Loan extended for short period usually up to 1(one) year is term as STL. This type of loan may or may not have specific repayment schedule. However, STL with repayment schedule is preferable. These loans are a variant of term loans and are the loans made out to finance borrowers house building requirements for both commercial and non-commercial purposes. Being a variant of term loan, in this case too bank usually has predetermined optimum exposure level which shall always be kept in mind in considering financing under this category. Besides borrower’s standing is thoroughly checked and only fairly cleared clients are entertained.House building finance for commercial purposes shall ideally be liquidated, within the time frame of repayment, through the income to be generated from the project. However, client’s resourcefulness is of paramount importance, the sector being highly sensitive to economic shocks. i) House building loan-General: These are the house building loan made to firm, company. iii) Home Loan: These are the House Building Loan made to individual under Personal Banking Division. This type of loan is made to facilitate purchase of transport of all types such as: road transports, watercrafts, aircrafts etc. However, commonly financed transports are road transports. Only brand-new and 100% reconditioned transports are eligible for financing. In case of importation of the vehicle total landed cost is to be calculated and retirement arrangements shall be determined before hand. This category of finance may be of short term or long term depending upon the nature of particular advance. Nevertheless, in this sector also bank usually has a predetermined global level of stake to be under taken. Transport loan is also sub-categorized, as below, in respect of financing to the staffs of DBL and to others. The transport loan awarded to other than DBL employees usually attract suitable collateral security. For providing finance for commercial purposes, apart from borrower’s stake at the proposal his credit worthiness, resourcefulness etc. are thoroughly determined. An extensive analysis is made to ascertain different aspects of the proposed credit such as: borrower’s experience, managerial ability, that the proposed route /purpose has adequate room for the proposed entrant etc. In this type also the repayment period and terms including gestation period should reflect the reality of the finance. excluding strategic and reputation risk. The operational risks are inherent risks and cannot be eliminated. They need to be managed.It is an integrated management of operational risks stand against the threatening of potential losses from underlying risks. The operational risks have some unfavorable properties that can constitute the largest risk exposure of any organization. They are inherent to business and therefore often entered unconsciously. They may hit directly and indirectly, i.e. via a credit risk or a market risk. Mostly there is no reward for entering them. They normally low frequency-high impact events play a very prominent role. The management already modified organ gram and separated corporate & retail functions from credit function. Tow new divisions namely Corporate Banking and Retail Banking were created. Various risk management processes have been initiated to all business units and management has upgraded its internal rating system. The Bank has appointed a Credit Rating Agency (CRA) for credit rating of Dhaka Bank Limited for the year 2008. Strong IT platform established covering the entire operations. Strong oversight by the Board, Executive Committee and the Audit Committee by adhering to good corporate governance. (Sector-Wise).Submission of Monthly Statement of Islamic Banking Branches.Submission of Quarterly Statement of Islamic Banking Branches. Submission of Monthly Statement of Assets and Liabilities on Dhaka Bank Limited. Submission of Half-Yearly Statement of Assets and Liabilities on Dhaka Bank Limited. Submission of Monthly Statement of Deposit and Advance Distributed by Rate of Interest. Submission of Monthly Statement of From- IX. Submission of Monthly Statement of SBS-1 (Schedule Bank Statistic) Return. Submission of Monthly Statement of SBS-2 (Schedule Bank Statistic) Return. CREDIT POLICY AND CREDIT APPRAISAL SYSTEM OF DHAKA BANK LTD.
Appraising a credit is the most challenging job for credit personnel. Basically credit appraisal is a sequential process which has lots of stages which needs to be fine-tuned every now and then. Once again the very significant risk of poor assessment of credit risk can change the overall picture of the loan portfolio. So it is pretty customary to have a logical but efficient credit policy to make the overall credit appraisal process value increasing. In this part of the report I am first going to present the currently followed credit policy of DBL and then I will discuss about the credit appraisal process of DBL. The followings are the various dimensions of the credit policy of DBL. It is never the concentration of Dhaka Bank Limited to sanction in one or two specialized sector only, rather DBL always tries to diversify its credit portfolio so that the overall risk level of the firm is decreased to a large extent. Getting familiar, familiar in the sense of moral character, financial condition is very necessary to know properly about the credit seeker.. If the borrower is a non-human legal entity, the familiarity should be with the past and present of the controlling persons. Usually there are one or two key persons in an organization irrespective of their position as Chief Executive Officer of the company and proper care shall be exercised in gathering and dissemination of information about such persons. This aspect calls for credit appraising official’s rapport with the society in the command area, as usually informal ways also have to be used for this job to be done. A basic consideration in extending credit is the integrity of the borrower. Integrity of the borrower is termed as necessary factor for the selection of borrower. Unless branch is fully satisfied about the integrity of the client, no credit facility is extended. From the record book of the client and from the day to day interaction with the client DBL can easily know about the integrity of the old clientele. For a new client utmost care shall be taken to assess integrity of the borrowers usually through face to face interview, track record with other banks /financial institutions, if any, establishing his background and ability. Competence of the borrower is properly analyzed. Competence of a client is reflected in his ability to furnish the required information as well as in attending the requested assistance. Moreover before the sanctioning of the loan the credit approving authority must know about the borrower / management well enough, that the borrower / management fully understands the problems its business / company faces, and that it is taking the appropriate actions to improve and / or restore its credit worthiness. Borrower’s optimum level of credit worthiness is very crucial factor in making a decision on a lending proposal. Especially in case of big borrowers this factor is carefully evaluated and all the credit facilities extended to the client by all financing institutions is taken into account. The branch accepts no proposal exceeding the optimum level of credit worthiness of the borrower at a particular point of time. The extent of facility requested is evaluated properly. The purpose, business type as well as optimum level of operation in respect of sector wise absorption capacity, management capability of business etc. are considered to determine an optimum extent of the facility. ii) That branch is always aware in respect of changing economic and political effects on such lending, particularly covering the repayment period..
Other considerations being good, profitability of the proposal becomes the prime concern of the apprising officer as because the essential purpose of lending is to maximize profit. Due to wide spread prevalence of default culture and conversely absence of a healthy practice in repayment of debt, DBL usually insists on tangible collateral securities. The basic consideration in evaluation of security of DBL is : the easiest to realize, the best. However regarding security the points to consider are type, value, ownership and reliability. Usually third party immovable property as security shall be avoided. The situation further aggravates if the third party security is not associated with any other security of the borrower in case of other than corporate concerns. In such a case relationship with the owner of the property and the borrower as well as considerations between them is carefully considered and satisfied. In analyzing security, valuation of it occupies a center place and it has been dealt with separately in our forgoing discussion. Branch considers ‘forced sale value’ of the security offered. CREDIT APPRAISAL SYSTEM OF DHAKA BANK LTD. There is no hard and fast procedure of availing credit, but the simpler, the quicker the whole process is the better it will be. 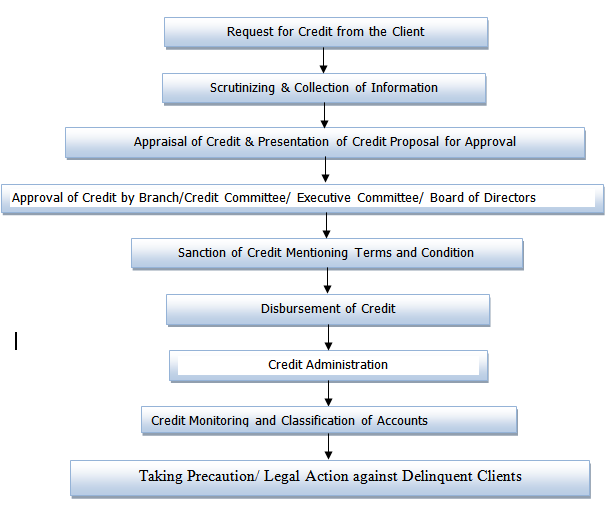 DBL generally follows the following credit appraisal process. Figure : Credit Appraisal System of Dhaka Bank Ltd.
• Government and semi government organization. Completeness of information is obtained by requesting the applicant to fill out a comprehensive application. Psychological attitudes toward the seriousness of credit obligations improve when the application is rather formal and complete. The applicant signs the application. Credit departments add words above the signature, which make the application a rather formal written contract. The clause is a testimony that the information is given for the purpose of obtaining credit and that the facts are complete and correct. The clause recites the terms and is drawn as contract between creditor and debtor. Direct inquiry one of the common methods of obtaining information to verify facts presented on the application of during the interview of an applicant for an initial credit transaction. A careful distinction is made between obtaining credit information directly form sources having such facts and between buying somewhat similar credit data in the form of prepared reports from the credit reporting bureaus and agencies. In-file ledger facts are one of the most important sources of information available to credit committee whether to accept or reject a larger amount of credit from an established credit customer. From the in-file records, credit analysts have at their disposal the experience of the concern with the customer. They know the customer’s payment habits, the complaints registered, the collection efforts, if needed to keep the customer in line with the established terms. • There is an account of the person want to take loan. The account is a transaction for not less than 3 months to 6 months; otherwise the loan will not be sanctioned. • After checking the duration of account then the transaction made by the account holder is checked. The debit credit position is also checked, because it is related with future dealings of the borrower. • The purpose for what the loan is taken by the borrower is another important matter that is checked. Whether the purpose is business or else is checked with its marketability. Because there is risk of fraud and forgery by the borrower by seeing one purpose in cash of doing any illegal business. • The banker checks through security whether it is enough or not. When credit officer is satisfied with his credit worthiness, financial capability, management ability and feasibility of the project through credit appraisal of clients in a prescribed form, he can hope for credit from the bank. Credit appraisal is done through ‘credit appraisal form’. Ratio analysis gives importance in case of project finance. But most of the medium quality loans are given on the basis of financial capability of repaying and credit worthiness of the client. Lending risk analysis is done in a prescribed form in case of large amount of loan, above 50 Lac. Credit officer prepares a credit proposal along with the prescribed ‘Credit Proposal Form’. Credit officer measures the risk associated with the credit facility. No credit proposal can be put for approval unless there has been a complete written analysis. It is absolute responsibility of the Proposing Officer to ensure that all necessary proposal documentation have been collected before the facility request is sent to the Sanctioning Officer. Branch Credit Committee: Branch credit committee to be headed by the Branch Manager, other members is selected by the manager in consultation with Head Office. Reviewing, analyzing and approving extension of credit in accordance with authority is established and delegated by the Board of Directors. Evaluation of the quality of tending staff in the bank & take appropriate steps to improve upon. Recommending credit proposal to the Executive Committee/Board of Directors which are beyond the delegated authority. Ensuring, that all elements of Credit application i.e. Forms, Analysis of statements and other papers have been obtained and are in order. Confirming that the transaction is consistent with existing loan policy and Bangladesh Bank guidelines & if not the Committee may prepare a recommendation form an exception to or change in policy for consideration by the Executive Committee/Board of Directors. Executive Committee: Approving credit facilities as delegated by the Board of Directors. Supervising the implementation of the directives of the Board of Directors. Reviewing of each extension of credit approval by the Head Office Credit Committee/Managing Director. Keeping Board of Directors informed covering all these aspect. Board of Directors: Establishing overall policies and procedures for approving and reviewing credits. Delegating authority to approve and review credits. Approving credit for which authority is not delegated. Approving all extensions of credit which are contrary to bank’s written credit policies. Most important step of providing credit facility is the sanctioning of credit. Because sanctioning authority will be held responsible for any discrepancy. In this step all the documentation is completed and the customer is sent an advising letter for the credit facility along with all the terms and conditions. Credit is sanctioned and disbursed strictly in terms of the approved Credit Operational Manual of the Bank and Head Office Circulars is issued from time to time. All norms informed through the Circulars of Credit Division in particular and all other relevant circulars in general, which are to be followed meticulously while exercising power. Credits will be subject of Bangladesh Bank restriction. The party to whom credit is allowed should be as far as possible within the command area i.e. Area of operation of the Branch. Deviations, if any are to be explicitly explained in the proposal. No Sanctioning Officer can sanction any credit to any of his near relations and to any firm/company where his relations have financial interest. Such cases should be sent to the Head Office. All Sanctioning Officers maintain a Sanctioned Register for recording serially all the credits sanctioned by him. Sanctioning officer will accountable for non-recovery due to his injudicious decision. All approval of credit facilities must be conveyed under dual signature. Ideally both the signatories must have the required lending authority. If however, two lending officers of the required lending are not available, one of the signatories must have the required authority. Disbursement of credits presupposes observance of all norms and procedures, which are conveyed through different Circulars of Head Office, issued from time to time. Credit application and Credit approval notes/analysis. Evidence of credit approval and data upon which approval was granted together with any comments, if appropriate. All supporting data such as financial statements and analysis, references, credit investigation results, CIB & other Bank reports and notes of all discussions with the borrower and other relevant parties with paper clipping. Correspondences call reports, site visit reports, stock report etc. each credit file shall be maintained in a secured location and where access restricted to authorized personnel’s only. Copies of the information may be kept where regular access is required. All charge documents is maintained in a place of utmost security. All charge documents as prescribed by the bank & local laws, for the relevant credit facility, Signed credit agreement, Signed guarantees or other evidence of credit security or collateral agreement shall be kept in fire proof safe under the custody of Branch manager or his designate alternative and another officer. A register of charge and security documents is maintained under the supervision of the Branch Manager. It is the responsibility of the Manager to monitor the over all profile and risk aspect of the credit portfolio in accordance with the criteria set down in the Bank Credit Policy. Such monitoring is evidenced from the comments of the Manager in monthly Call/Visit Report and be kept in the Credit File with a copy to the Head Office. This Review is formally performed at intervals prescribed by Head Office but it is the responsibility of the Manger to ensure at all times that the credit portfolio meets the standard set forth by the Bank. I. Terms of approval has been maintained. II. Conduct (turnover, regularity of repayment etc.) of the borrowing accounts during the period under the review has been satisfactory or as expected. III. Continuing value of the collateral is adequate. IV. There are no adverse trends in market, economic and political conditions which may endanger the reliability of the facility. V. Business reciprocity offered and received is commensurate with the facilities allowed. VI. Earning from the account is cost effective (i.e. adequate to meet business cost of funds and leave sufficient margin for adequate risk reward, overheads and profits). VII. Borrowers business is being satisfactorily conducted as reflected through a review and analysis of the financial and operating statements. General Norms for Monitoring Credit Facilities: The Branches submits a monthly statement of the credits allowed under the discretionary powers of the Manager to the Head Office irrespective whether the same are outstanding or not on the date of return. Taking Precaution/Legal Action against Delinquent Clients. Whenever loan is termed as NPL or it has become CL or in the verge of becoming classified DBL takes necessary precautionary measurements such as making provision for that loan, information transmission to the MIS department, Bangladesh Bank etc. Never DBL had become too strict with the defaulter client rather it is the moral persuasion, rearrangements with the party by increasing repayment time, or allowing some rebates over payments etc are common tools used by DBL in collection of the defaulted amount. But after all the measures have been tried if then nothing positive happens then DBL seeks for the legal remedies. Financial Statements are the means of reporting economic activities of an enterprise to the stakeholders. The economic activities are logically presented in the financial statements so that the user can easily understand the operating result of the economic activities undertaken and financial position of the entity. In this case, some standard reporting formats are used and the formats are prescribed by the local laws and by the local or international accounting standards. Accepting deposit and extending credit with a view to earn profit. Bank pays certain interest to the depositors (Prime expense) and receives interest from the borrower (Prime number). Remitting fund, investing in the capital market, Locker services, Safe custody, ATM. Debit and credit card services, financial advisory and a lot others. Income Statement is a statement of Revenues and Expenses in which periodic expenses are deducted from the revenues. This statement is prepared to know the operating result of a period of time i.e. to know periodic income or loss. Balance Sheet is statement of Assets, Liabilities, and Owners Equity. This is prepared to know the financial condition of a business entity at a particular point of time. Statement of changes in Owner’s Equity is a statement which is prepared for a period to determine the owners claim on the resources of the business. Cash flow (C/F) Statement shows the inflows and outflows of cash and finally the balance of cash at the end of a period. The Dhaka Bank Limited was incorporated in Bangladesh has a public limited company with limited liability as on 6 April 1995 under Companies Act 1994 and commenced commercial operation on 5 July 1995. The company went for the public issue of shares on 18 November 1999 and its shares are listed with the Stock Exchanges of Bangladesh. Now it has 44 branches all over Bangladesh, an offshore banking unit at EPZ, Dhaka, 2 SME Business Centers and 3 units of Capital Market Services (CMS). The principal place of business is the registered office at 100, Motijheel Commercial Area, Biman Bhaban , Dhaka-1000, Bangladesh. The principal activities carried out by the bank include all kinds of commercial banking activities.. Out of the above, two branches of the bank are run under Islamic Shariah , the modus operandi of which is substantially different from other non- Islamic branches. The bank is listed with Dhaka Stock Exchange and Chittagong Stock Exchange as a publicly quoted company for its general class of shares. A Banking software system ’FLEXCUBE’ produces consolidated Balance Sheet and Profit & Loss Account including Offshore Banking and Islamic Banking operation. These consolidated records are maintained at the Head Office of the Bank based on which these financial statements have been prepared. The financial statements of the Company are made up to 31 December each year, and are prepared under the historical cost convention and accordance with first schedule of Bank Companies Act (BCA) 1991 as amended by Bangladesh Bank ( Central Bank) BRPD Circular No. 14 dated 25 June 2003, other Bangladesh Bank circulars, International Financial Reporting Standards (BAS), the Companies Act 1994, the Listing Regulations of the Stock Exchanges, the securities and Exchange Rule 1987 and other laws and rules application in Bangladesh on a going concern basis. The bank operates Islamic Banking in two branches designed for the purpose inComplying with the rules of Islamic Shariah. The operations of Islamic Branches are Accounted for and the financial statements of the branches are prepared as per Bank Companies Act 1991, Bangladesh Accounting Standard issued by the Accountancy & auditing organization for Islamic Financial Institutions for which a separate set of Books and records are being maintained. The off-shore banking unit maintains its accounting records in USD from which Accounts are prepared according to the Bank Companied Act 1991, Bangladesh Accounting Standards and other applicable directive issued by Bangladesh Bank. Dhaka Bank also performs brokerage operation through its three units under the license issued by Securities & Exchange Commission (SEC), Dhaka, Bangladesh. The unit maintains its accounting record through consolidation with Head Office General Ledger. Interest is calculated on daily product basis but charged and accounted for quarterly on accrual basis. Interest on Classified loans is kept in interest suspense account as per Bangladesh Bank guidelines and such interest is not accounted for as income until realized from borrowers. Interest is not charged on loss loans as per instructions of Bangladesh Bank. Loans and advances written off to the extent that (1) there is no realistic prospect recovery (2) against which legal cases are pending for more than five years as per guidelines of Bangladesh Bank. However write off will not reduce the claim against the borrower. The securities under this category are the securities acquired by the bank with the intention to trade by taking advantages of short term price / interest movement, and the securities those are classified as HFT by the banks held in excess of SLR ( net of CRR) at a minimum level. Investments classified in this category are principally for the purpose of selling or repurchasing on short trading if designated as such by the management. In this category, investments are measured in fair value and any change in the fair value i.e. profit or loss on sale of securities in HFT category is recognized in the statement of income. For the shortfall in the market price of shares, adequate provisions have been made. Branch adjustment account represents outstanding Inter-Branch and Head Office transactions but yet to be responded at the Balance Sheet date. The balance of unreconciled items has been adjusted subsequently date of financial statements. All fixed assets are stated at cost less accumulated depreciation. Depreciation is charged using straight-line method at the following rates on cost of assets for the full period irrespective of their date of purchase. No depreciation has been charged on Land. Furniture & Fixtures10.00% p.aOffice Appliance & Equipment20.00% p.a.Computer20.00% p.a.Vehicle20.00% p.a. Non-banking assets are acquired on account of the failure a debtor to repay the loan in time after receiving the decree from Court regarding the right & title of mortgage property during the period of financial statements. The value of the properties has been incorporated in the books of accounts on the basis of third party valuation report. Leases are classified as Finance Lease whenever the terms of the lease transfer substantially all the risks and rewards of ownership to the lessee. All other leases are classified as operating Leases. Amounts due from leases under finance lease are recorded in the assets side of the Balance Sheet at the amount of the bank’s net investment in the leases. Finance lease rental income is allocated to accounting periods so as to reflect a constant periodic rate of return on the bank’s net investment outstanding in respect of the leases. No depreciation has been charges for such lease in the account. Assets held under finance leases are recognized as assets of Bank at fair value at the date of acquisition or if lower, at the present value of the minimum lease payments. The corresponding liability to the lessor is included in the Balance Sheet as a Finance Lessee obligation. Lease payments are apportioned between finance charges and reduction of the lease obligation so as to achieve a constant rate of interest on the remaining balance so as to achieve a constant rate of interest on the remaining balance of the liability. Finance charges are charged directly against Income. Branch adjustment account represents outstanding Inter-Branch and Head Office transactions but yet to be responded at the Balance Sheet date. The balance of unrecognized items has been adjusted subsequently date of financial statements. compliance are adhered by all branches and divisions of Head Office. Amount represents interest receivable with other banks, call loans, interest receivable on loans and advances, fees receivable etc. Amount paid in advance against opening of new branches, various types of insurance premiums, legal expenses software maintenance etc, including advance for Head Office Building of Tk. 4.10cr. as work in progress. Amount of Suspense Account represents amounts paid against renovation against various contracts. Financial ratio analysis is the calculation of ratios that are derived from the information in a company’s financial statements. The level and historical trends of these ratios can be used to make inferences about a company’s financial condition, its operations and attractiveness as an investment. Financial ratios are calculated from one or more pieces of information from a company’s financial statements. In context, a financial ratio can give a financial analyst an excellent picture of a company’s situation and the trends that are developing. A ratio gains utility by comparison to other data and standards. Financial ratio analysis groups the ratios into categories which tell us about different facts of a company’s finances and operations. I. Liquidity Ratios: It gives a picture of a company’s short term financial situation or solvency. ii. Leverage Ratios: It shows the extent that debt is used in a company’s capital structure. iii. Profitability Ratios: which use margin analysis and show the return on sales and capital employed. iv. Operational Ratios: It uses turnover measures to show how efficient a company is in its operations and use of assets. v. Market Value Ratios: which give a picture of a company’s ability to generate cash flow and pay it financial obligations. As of 31 December 2008 total asset of the Bank stood at Tk. 71.14 billion, an increase of 24% as against 2007. The increase in asset was mainly driven by significant growth of customer deposits. The growth of deposits was used for funding in loans & advances and holding of securities for SLR. The Cash & Balances with Bangladesh Bank and its Agent registered 25% growth as of 31 December 2008. The growth of deposits increased the balances with Bangladesh Bank and its agent for maintaining the Cash Reserve Requirement (CRR), which was maintained adequately. The Balances with Other Banks and Financial Institutions increased by 39% which was mainly due to transfer of fund to Current Accounts of different banks for covering the payments against Inward Foreign Remittances to beneficiaries. This was the major functional area of the Treasury Division of the Bank. The Bank registered a negative growth of 6% in Money at Call & Short Notice as against previous year. The amount of Placement was invested at higher rate of interest to NBFIs during the year 2008. The Bank’s Investment during the year 2008 were mostly in long term Government Securities which stood at Tk.7,239 million as against Tk. 5,972 million making a growth of 21% over the last year. The Government Treasury Bonds purchased at higher rate of interest to cover the increased SLR arising from the growth of deposit liabilities. The Bank implemented the system of credit risk assessment and lending procedures by stricter separation of responsibilities between risk assessment, lending decisions and monitoring functions to improve the quality and soundness of loan portfolio. The Bank recorded a 24% growth in advances with a total loans and advances portfolio of Tk.49,698 million at the end of December 2008 compared to Tk. 39,972 million at the end of December 2007. As of 31 December 2008, 96.16% of the total Bank’s loan portfolio was regular while only 3.84% of the total portfolio was non-performing as compared to 3.15 % of 2007. Bank made required provision as of 31 December against performing and non-performing loans as per rate and classification norm provided by Bangladesh Bank. The volume of non-performing loans stood at Tk.1,908 million in 2008 from Tk. 1,258 million in 2007. Of the total loan provision of Tk.1,445 million, Tk.620 million was general provision, which was 43% of the total provision. The rest Tk.825 million was against the classified accounts. A wide range of business industries and sectors constitutes the Bank’s advance portfolio. Major sectors where the Bank extended credit include steel & engineering, ship breaking, edible oil, sugar, housing & construction, pharmaceuticals, chemicals, electronic & automobiles, energy & power, service industries, trade finance, personal / consumer credit, leasing etc. Sect oral allocation of advances reveals a well-diversified portfolio of the Bank with balance exposure in different sectors. High concentration sectors are textile and garment industries with outstanding of Tk.10,216 million, housing and construction with Tk.4,669 million, food and allied industries with Tk.2,729 million and engineering and metal including ship breaking with Tk.2,505 million as at 31 December 2008. Dhaka Bank Limited experienced sound growth of export business in 2008 from 2007. The volume of export business rose to Tk. 39,038 million from Tk. 31,081 million in 2007 showing an increase of 26%. As before, readymade garments still remained the major export item of 2008. The other export items were jute, accessories (buttons, interlinings, labels etc.) and footwear etc. Dhaka Bank Limited has ended the year 2008 with total Inward Foreign Remittance of Tk.11,834 million. It has commenced its operation with the view to serving the expatriate Bangladeshis through fast and efficient disbursement of remittances. Providing fast and efficient service to its expatriate clients has been the banks top priority, along with increasing the inflow of foreign currency to contribute to the country’s foreign reserve. We begin our journey in 2009 with a view to avail further Banking Services to its valued clients local and abroad. Total liabilities of the Bank stood at Tk.67,137 million as of 31 December 2008 registering a growth of 24% over the last year. This has happened for increase of deposits from customers mainly and settlement of import payments against deferred and cash Letter of Credits. The deposit base of the Bank continued to register a steady growth and stood at Tk.56,986 million excluding call as of 31 December 2008 compared to Tk. 48,731 million of the previous year registered a 17% growth. The growth was supported by branch network and high standard products and service along with competitive interest rate provided to customers. The customer group of the Bank was Individuals, Corporation, NBFI, Government Bodies, NGO, Autonomous Bodies etc. network and high standard products and service provided to customers. The customer group of the Bank was Individuals, Corporation, NBFI, Government Bodies, and Autonomous Bodies etc. Dhaka Bank Limited commenced its operation on July 05, 1995 as a private sector bank with a authorized capital of Tk.1, 000 million and paid-up capital of Tk.100 million. The Bank raised its authorized capital from Tk.1, 000 million to Tk.2, 650 million in 2005 and Tk. 6,000 million in 2007. The paid-up capital of the Bank amounted to Tk.1,934 million as of 31 December 2008. Paid-up capital increased by Tk.387 million (bonus share of 2007) in 2008. The statutory reserve also increased by Tk.373 million during the year by transferring 20% of pre-tax profit as per Companies Act 1991. The total shareholders’ equity (capital & reserve) of the Bank as at the end of December 2008 stood at Tk.3,999.51 million including sponsor capital of Tk.1,113 million. The Bank also made general provision of Tk.620 million as per rate given by Bangladesh Bank against the unclassified loans and advances, which will be treated as supplementary capital. The strong growth in equity will help the bank to expand its business. Interest income increased by 27% from Tk. 5,636 million in 2007 to Tk.7, 171 million in 2008. The high growth of advance resulted this high growth of interest income. Average yield on advance was 14.91% during 2008. Income from investments increased by 26% from Tk.529 million in 2007 to Tk.664 million in 2008 mainly due to the purchase of five and ten years Government Bonds at higher rate of interest for SLR purpose. Commission and Exchange earnings increased by 32% from Tk. 819 million in 2007 to Tk.1,077 million in 2008 due to increase in brokerage commission, L/C & L/G commission, exchange earning and other fees & commission income. The Net Interest Margin (NIM), which is derived by net interest income divided by average assets, was 4.60% in 2008 as compared to 4.54% in 2007. The decrease of Net interest margin (NIM) was mainly because of higher cost of deposits which results the lower spread. Net Interest Income (NII) increased by 24% from Tk. 2,116 million in 2007 to Tk.2,622 million in 2008 mainly due to increase of interest income from both advances and investments. Interest expense increased by 29% from Tk. 4,049 million in 2007 to Tk.5,214 million in 2008. This rise in interest expense is mainly attributable to the overall increase in Deposit rates in the market. Salary & Allowance increased by Tk.121 million mainly due to the revised pay scale effect from July 2008, recruitment of new staffs, annual increment etc. Other overhead expenses increased by Tk.72 million mainly because of lease rental for fixed assets, increase of advertisement in electronic and print media for business development, opening of some new branches, printing stationery, online communication charges, insurance, office rent, repair & maintenance, direct sales agents remuneration, contractual agency charges etc. Dhaka Bank Limited registered an operating profit of Tk.2,533 million in 2008 compared to Tk. 2,010 million in 2007 making a growth of 26%. After all provisions including general provisions on unclassified loans, profit before tax stood at Tk.1,864 million. Provision for tax for the year 2008 amounted to Tk. 1,025 million. The net profit of the Bank as of 31 December 2008 stood at Tk.839 million compared to previous year’s Tk.704 million making growth of 19%. Earning per Share (EPS) was Tk.43.97 in 2008 compared to Tk.36.39 in 2007. Capital adequacy is measured by the ratio of the Bank’s capital to risk weighted assets both on balance sheet and off balance sheet transactions. The capital fund of the Bank increased by Tk.1,128 million in 2008. Shareholders’ equity grew by Tk.839 million and stood at Tk.3,999.51 million during the year. Total capital (Tier-1 & Tier-2) of the Bank as of 31 December 2008 stood at Tk.4,808 million against Tk.3,680 million of 2007. Bank’s risk weighted assets increased by Tk.5,820 million and stood at Tk.40,598 million in 2008 due to mainly increase of loans and advances. According to Balance Sheet 2008, capital ratio was equivalent to 11.84% of Risk Weighted Assets against 10.36% of 2007. Though I am not in any position to provide any assistance for the betterment of this bank, but I am expressing my task from two months observation. Some of my observations are not mentioned here rather it has given as recommendation directly. Despite the fact that 2009 was a year of many challenges, the Bank was managed quite successfully. The year was concluded with a steady growth and the market share was retained in all areas of operations. Bank management is confident about its ability to sustain its earning capacity and maintenance of asset quality in the coming years. In credit management, it is conventional that proposals of credit facilities must be supported by a complete analysis of the proposed credit. More importance should be given on refund of loans out of funds generated by the borrower from their business activities (cash flow) instead of realization of money by disposing of the securities held against the advance, which is very much uncertain in present context of Bangladesh, where a number of creditors are willful defaulters. Credit officer measures the risk associated with the credit facility. He should not be liberal in this respect; he should strictly follow the credit evaluation principle setup by the bank. The analysis should contain information about the borrower, credit purpose, credit repayment sources, details of collateral security with valuation and guarantee. It should also contain an assessment of the competence and quality of the borrower’s management ability, the general economic and competitive environment of the borrowers industry and other pertinent factors, which may affect the borrower’s ability to repay the facility, should be given much importance. It should improve in file management system to faster the dealings with the client’s proposal. Return on Equity (ROE) model is a good model for measuring returns and risks associated with a bank regarding its credit facilities provided by the bank. a) CRG manual prescribed by Bangladesh Bank should be upgraded. b) Loan should not be concentrated on one sector rather it should be more diversified. c) New credit products should be introduced to reflect clientele need. d) Products should be priced on risk-reward basis. e) The overall credit appraisal process should be fine-tuned. f) While availing short term credit evaluation process should be checked more precisely. g) Speed up processing of loan application. h) Bank should introduce more modern technology based product. i) Information system should be upgraded so that MIS department can update every credit instrument’s impact on the overall bank performance. j) Detail Manual should be prepared for accurate credit operation. k) Some discretionary power should be given to the branch management. l) Reduce classified loan on an emergency basis. Dhaka Bank Limited which had been started its journey first at 1995 with the commitment of “Excellence in Banking” still now it is trying to fulfill its commitment. By providing its maximum its services to its customers it has been regarded a profitable business organization now. Now a day it has Forty-Five branches in various places of the country. They are also trying to increase its number of branches now. Here the most significant part of this report is about the various aspects of Credit Rating and Capital Preservation and bank’s financial performances. They should adopt this strategy of allocating resources to the most profitable line to improve performance. These services make Dhaka Bank Limited (DBL) unique in the banking in the private sector of Bangladesh. During the internship, it is found that the branch provides all the conventional banking services as well as some specialized financing activities to the economy. The Credit department provides all the services related to international and disburse credit if the proposal is sound. As specialized financing, it provides term finance to medium and small-scale industries.They playing an important role in the banking system and expansion of business & industry for economic development of Bangladesh.